The struggle to perform well is universal: each of us faces fatigue, limited resources, and imperfect abilities in whatever we do. But nowhere is this drive to do better more important than in medicine, where lives may be on the line with any decision. Atul Gawande, the New York Times bestselling author of Complications, examines, in riveting accounts of medical failure and triumph, how success is achieved in this complex and risk-filled profession. At once unflinching and compassionate, Better is an exhilarating journey, narrated by "arguably the best nonfiction doctor-writer around" (Salon.com). Atul Gawande's talent for bringing complex issues before the general public lies in his excellent writing ability, apparent in his earlier work, "Complications." He explores the issues of current medicine in penetrating essays that can be grouped into three categories: Diligence, Doing Right, and Ingenuity. Doctors in the United States today are facing a litigious public that demands perfection from mere mortals. Gawande presents a balanced picture from the view of patients and their families as well as from doctors' perspectives. The economy of his writing permits the reader to zero in on the issues quickly. I must say, right from the outset of this collection, that the essay on hand washing has made me leery about any doctor's touch. Today's headlines about incurable bacterial infections now reaching into our school systems bear out the relevance of Gawande's concerns. I see no sense in rehashing all the essays here. As a reader, you should know that these essays are highly relevant to all of us and underscore what we don't know about our healthcare. When we enter a facility for treatment, for instance, do we know where that facility stands in relation to positive outcomes for the condition we need treated? If not, why not? I did especially like the essay about medicine in India, as I frequently visit there on business. I think Gawande's thoughts about achieving better results through diligent adherence to what we already know works is good advice for many areas in life, not just medicine. This book will be a great read for you if you're interested in the practice of medicine and how it could be done better. You'll love it if you simply enjoy lucid writing about the practice of medicine. But this book also offers you great lessons if you want to understand how science and performance management come together as they should in business or any other field of endeavor. That's because the author sets out to answer a question that is as important for people in business as it is for people in medicine. What does it take to be good at something when it is so easy not to be? Gawande ways that most people, especially physicians, think that success in medicine comes from canny diagnosis, technical prowess and the ability to empathize. They think that progress in medicine comes from scientific breakthroughs and sophisticated equipment and procedures. Again and again Gawande demonstrates how concentrating on patients and on performance leads to improvement for both individuals and for medical practice in general. He does this with a mix of historical examples, patient stories, statistics and stories from his own life and practice. He divides the book into three sections corresponding to his three necessities for improvement. In the section on Diligence the chapters are on washing hands, dealing with polio in India, and dealing with casualties from the Iraq war. The chapter on military medicine and the concentration on process improvement is worth the price of the book if you're in business. One of the most powerful lessons of this book is that process improvements can lead to dramatic improvements in performance. The section on Doing Right deals with ethical issues that physicians face. The chapters are on medical malpractice, whether and how physicians should be involved in executions, when a physician should fight to keep a patient alive, and the problems and dilemmas of how the business side of medicine affects how medicine is practiced. The central messages of this section are that "Choices must be made. No choice will always be right. There are ways to make our choices better." How to learn about making better choices is the subject of the third and final section of the book. In Ingenuity or "thinking anew," Gawande covers measuring the comparative effectiveness of physicians and medical centers, relative and absolute measures of performance, the practice of obstetrics as a model of change, and how physicians in less developed countries get by without the technology and facilities that are characteristic of US medicine. This section is about how to do better. You can sum it up this way: there is a bell curve in almost all human activities with huge variations in performance between the best and those in the middle of the pack. Measuring results is the way to get results that matter. This book is about the practice of medicine but it's also about getting better at whatever it is that you do. Gawande's message is that "better is possible." It requires diligence and moral clarity, the willingness to try and measure outcomes, and the discipline to change what you do based on the results you get. I thought Atul Gawande's last book, Complications, was one of the best books written on the medical profession in a long while. In it, Gawande showed a deep respect and sympathy for patients while trying to be clear about what would help the medical establishment do a better job from a doctor's point of view. In this book, he covers some of the same ground but, as his title implies, here he is focused specifically on what it takes to do things better as a doctor. The chapters here are grouped under three big heading which Gawande feels are the categories of improvement: diligence, doing right, and ingenuity. Within that, he tells some fascinating stories. Under diligence, he describes how simple persistence can improve performance significantly. For example, simple compliance with washing hands before and after each interaction with a patient would reduce unnecessary infections greatly and yet it is one of the poorest areas of performance in many medical establishment. My wife had a baby a couple weeks ago at a well-respected New York City hospital (that shall remain nameless) and, having read this book, I couldn't help but watch the hand washing. Though there was hand-washing going on, my anecdotal results were somewhat disappointing. It's scary. And yet, his stories of the effort to send polio the way of smallpox and the amazing success rates of medical teams in Iraq through no more than basic diligence with well-established methods give readers hope. Under doing right, Gawande tells stories of the continuing debate over what constitutes right and wrong in medicine. What is the proper way to interact with someone who you have to examine naked? When is it fair to sue a doctor and how much is it worth? What should a doctor be paid for their services? Should a doctor participate in executions at prisons, considering the methods we use now are basically medical? When should a doctor continue treatment at all costs or let a patient die? These are questions with no easy answers and Gawande takes a balanced approach. Under ingenuity, he discusses some simple, clever ideas that have helped improve performance in various areas. His wonderful chapter on childbirth focuses on the Apgar score for newborns. As most know, this is a number ubiquitous now at the birth of a baby. It wasn't even developed by an OB/GYN. It was developed by an anaesthesiologist. It required no new medical techniques. It simply required doctors and nurses to do a directed assessment of a baby at birth. And yet, this simple, ingenious change, dropped child mortality rates significantly as babies previously thought to have no chance were given a chance and hospitals competed to "improve" their Apgar scores. In this section he also has a discussion on how true analysis of doctor and hospital performance is rare but, when used, greatly improves success as well as a discussion of the amazing cleverness of doctors in the poorest parts of the world to do procedures with limited equipment. It was incredibly eye-opening. A fascinating and quick read, in each section there are plenty of inspiring stores about doctors making a difference. Dr. Atul Gawande, a general surgeon at Brigham and Women's Hospital and staff writer for the New Yorker has keen observation and insight to make single stories demonstrate not only the failings of our healthcare system but also the solutions to them because of individuals asking questions on how to do better. Ultimately, one of the questions he asks is how can doctors and hospitals be positive deviants? How does one become a positive deviant or an outlier that pushes beyond convention and advances patient care to new levels? He gives examples of how over four million children need to be vaccinated in Northern/Southern India in three days to prevent a large polio outbreak. An immunization rate of less than 90 percent would be considered a failure. Dr. Gawande talked about the evolution of obstetrics. After a damaging report in 1933, the specialty consequently committed itself to standardizing childbirth ensuring that with the new medical knowledge that it was applied consistently and routinely throughout the country. As a result maternal death in childbirth fell 90 percent from one in 150 in the 1930s to one in 2000 by 1950s. With continued innovations and the commitment to do better, the chance of a woman dying in childbirth is less than one in 10,000 today. There are plenty of amazing examples that you don't have to be a doctor to relate on how truly inspirational these individuals are in times when the stakes could not be higher - life or death. As a practicing family doctor, I believe that our healthcare system can do better in providing all of us the best care consistently and routinely across the country. Although his book is easily a classic and should be required reading for all future doctors, sadly I think true healthcare reform and improvement are years away. I wrote the book Stay Healthy, Live Longer, Spend Wisely: Making Intelligent Choices in America's Healthcare System specifically so everyone has the information they need to get the best care today. Until our healthcare system improves to its full potential as Dr. Gawande challenges us to do, unfortunately will always remain benefiting those who are insiders and harming those who are not. The real question is which one are you? Atul is not only a great doctor, but a very gifted story-teller. His stories are interesting, quirky, surprising and filled with feeling. From my perspective the selection of essays in this second volume feels a little uneven compared to Atul's first book, "Complications". Some of the essays in this second volume are a tad dry. The surgeon I got the book for as a gift reported that he found it very relevant. "When the stakes are our lives...we want no one to settle for average." Atul Gawande, in "Better: A Surgeon's Notes on Performance," asks, "What does it take to be good at something in which failure is so easy?" When someone's well-being is at stake, is mere competence enough? The author maintains that a great deal more is needed "to enable every human being to lead a life as long and free of frailty as science will allow." With so much on the line, knowledge is not enough. To do their best, doctors should be conscientious, technically proficient, morally scrupulous, resourceful, and compassionate. The author examines "three core requirements for success in medicine": diligence (attention to detail and avoidance of errors), "to do right," and ingenuity ("thinking anew"). Is a doctor willing to look at a difficult situation in a new light? Can she confront her failures, learn from them, and change? Dr. Gawande presents specific examples of medical professionals meeting a variety of challenges and, in the process, transforming medical care and saving lives. In this elegantly written book, the author makes the abstract real. He does not merely focus on dramatic events; he also demonstrates how the seemingly mundane can be crucial. One example centers on infection control. Deborah Yokoe, an infectious disease specialist and Susan Marino, a microbiologist, have done their utmost to reduce the spread of infection in their Boston-based hospital. Two million Americans acquire infections every year during their hospital stays and thousands die as a result. One way to cut down on infection in hospitals is for clinicians to carefully and consistently wash their hands. Yokoe and Marino have tried everything to get doctors and nurses to wash. They have posted warning signs, installed new sinks in convenient locations, given rewards to the units with the best rates of compliance, and even issued hygiene report cards. Nothing has worked. Doctors and nurses simply do not take the time to wash their hands as much as they should. As a result, the rates of infection in the hospital remain higher than they should be. Two other individuals in Pennsylvania, however, came up with innovations that actually made a difference. Peter Perreiah, an industrial engineer, devised an ingenious system that made each hospital room function like a mini-operating room. Jon Lloyd, a surgeon and colleague of Perreiah, promoted the idea of "positive deviance--the idea of building on capabilities people already had rather than telling them how they had to change." By inviting the staff to come up with their own solutions rather than imposing rules from above, "the norms began to shift." One year into the experiment, infection rates dropped precipitously. Gawande demonstrates time and again that when people rack their brains to come up with answers, they can solve seemingly intractable medical problems. The author's account of the Herculean efforts expended to eradicate polio in India and to save the lives of wounded soldiers in Iraq are fascinating and impressive. Equally engrossing are the sections dealing with best practices in obstetrics and effective treatments for cystic fibrosis. Dr. Gawande's remarks concerning how far physicians should go to keep their patients alive raise intriguing questions without offering facile answers. "In the face of uncertainty, wisdom is to err on the side of pushing, to not give up. But you have to be ready to recognize when pushing is only ego....You have to be ready to recognize when the pushing can turn to harm." The author believes that medical decisions should always be based on the best interests of the patient, and fruitless suffering should be avoided. This is a tough call and wise doctors will not hesitate to consult with their colleagues to get other opinions. My one quibble is that Gawande's segments focusing on doctors' income, malpractice, and the ethics of physician-assisted executions do not fit comfortably in a work about enhancing medical performance. The bottom line is that "arriving at meaningful solutions is an inevitably slow and difficult process." Common to all successful initiatives is the willingness to face challenges with a determination to do whatever it takes to find remedies. Atul Gawande is a thoughtful and intelligent writer; his graceful prose makes "Better" an absolute pleasure to read. We can only hope that Dr. Gawande's colleagues will pick up on his admirable enthusiasm for behaving more responsibly, creatively, and diligently. If you are searching for a physician, how do you go about determining who is the best one to serve your needs? Where is there published data which gives you the opportunity to make rational decisions about your medical care? I am not a scientist, and when a friend tells me so and so is a great doctor, I translate that to myself to mean my friend likes his/her doctor. How do we judge? Clearly, 50% of all doctors graduated in the bottom half of their medical schools. Not that that, in and of itself is a necessary determinant of whether or not someone is a good physician. But what is? Dr. Gawande uses many anecdotes to show how the nascent science of improving performance amongst medical professionals is the key to longer, healthier lives. Gawande asks hard questions of his profession, as well as of himself: if he's an average surgeon, should he be trusted with someone's life, or their child's life? Shouldn't we have a right to know how our doctors rate, when there are objective standards that can be applied to performance? Fairview Children's Hospital in Missouri treats patients with Cystic Fibrosis. The patients who are seen at that hospital, consistently outlive patients seen at other hospitals who have the same condition. Gawande argues that data, such as that, should be readily available both to patients and their families, so they can make informed choices about their care, but also for doctors so they can improve their own performance. "Better" is a wonderfully written collection of descriptions of people who have been committed to asking a question, implmenting a change, and truly helping many many people. The stories are focused on improvements of health care, which I enjoyed, but are useful for people thinking about and eager to improve any industry or situation. "Better" is easy to read and I learned from reading this book. This is a great book to pass to your children and colleagues. The inspiration for this review has come from Dr. Gawande's fourth suggestion to `write something'. He has done a fabulous job of giving us a rare insight into the ecosystem of medical professionals. I must admit that his book has provided a very detailed picture of what the global healthcare system faces today. The three principles of a person being diligent, doing what is right, and using ingenuity are nicely elucidated with the help of stories from his own observations and experiences. This makes for a lucid and interesting piece of written work. However, this comes with a warning. He has tried to involve his reader emotionally throughout his stories, which can be uncomfortable for some. Also, his examples of clinical medicine in emerging countries have not been fairly portrayed, in my opinion, to explain the reasons for the disparities in care. He has praised individual achievement in spite of adversity, but has not delved deeper into the problem of mismatch between the sheer number of patients and resources available, something very uncommon in the West. He has ended his book well by giving five suggestions that are `lessons' from the book and these will prove handy most readers. The key lesson for me was, again, to write something as a way of participating in the process. Everyone will learn something new from this book. Atul Gawende's "Better" should be mandatory reading for anyone engaged in providing, regulating, or legislating health services. Gawende, a general surgeon who specializes in endocrine surgery at Boston's Brigham and Women's Hospital, has written a provocative and insightful book on how we can improve healthcare today. He is quick to admit that true success in medicine is not easy. It requires will, attention to detail, and creativity. "Better" shows, however, that it is possible anywhere and by anyone. The author illustrates this with case studies showing how diligence, doing it right, and ingenuity can make a big difference. Gawende argues that once we've made a science of "performance" - as he shows with simple examples of hand washing, a polio "mop-up,"wounded soldiers, child delivery - thousands of lives can be saved. Today, the scientific effort to improve performance gets only a miniscule portion of scientific budgets. Yet it can arguably save more lives in the next decade than bench science, more lives than research on the genome, stem cell therapy, cancer vaccines, and all the other laboratory work we see in the press. The stakes are high. Gawende is arguable the best nonfiction doctor-writer around today. Appreciate life and do better! The title of this book is great. Gawande's notes on performance will provide a lot of information. He writes about malpractice headaches, insurance obstacles, medical resources in the war and how medical teams have helped so many soldiers. He also mentions a physicians role in the death penalty (that there shouldn't be one) and tells the reader a little about the history of executions. He also provides some history of childbirth and history of tools used. I found out about an inspirational woman named Virginia Apgar too by reading this book. The "fighting on" section did make me emotional and I'm so glad I wasn't somewhere public while reading it. As good as Gawande's first book. Better" is as good as Gawande's first book. Gawande is interested in the improvement of medical practice, and he combines personal experiences and observations with a study of best practices by others. He is obviously comfortable in interviewing both patients and doctors, as well as being brilliant and an entertaining writer. As it happens, only because his daughter urged him, he got a second opinion on her psoriasis, and it was cleared up with a common antibiotic. I am sure Gawande had researched her problem, so this illustrates the point he makes later that there is a need for more informal write-ups of things which seem to work. My daughter had a similar experience with a different problem. I was surprised to learn that he expects 2% of his surgeries to go wrong: either there will be life threatening bleeding, or collateral damage like harm to a critical nerve, or a wrong diagnosis. I enjoyed some chapters more than others, but I have no confidence my rankings will correspond to those of other readers. Anyway, I liked most the chapters on the problems in implementing better hand washing; how treatment of Iraq war wounds was dramatically improved; medical malpractice; medical care in India; and, my favorite, the chapter on the bell curve as illustrated by treatment for cystic fibrosis. I think Gawande really has something in suggesting that the U.S. handle inadvertent harm by doctors as it does harm from vaccines. However, like with unemployment insurance, doctors and hospitals should have to pay more into the fund if their history has been bad. Dr. Atul Gawande, General Surgeon at Brigham and Women's Hospital--Boston, Assistant Professor at Harvard Medical School, Staff Writer for The New Yorker, and Best-Selling author of Better writes about the importance of washing hands and how to actually cut the spread of potential lethal disease. He states that approximately two million Americans pick up an infection while in the hospital. Of these, ninety thousand will die from that same infection. Possible attacks come from rotavirus, Norwalk virus, Pseudomonas bacteria, resistant Klebsiella, MRSA-- methicillin-resistant Staphylococcus aureus, and VRE-- vancomycin-resistant Enterococcus--the last two frequently causing pneumonias, wound and bloodstream infections. Admittedly, Dr. Gawande recognizes that studies show nurses and doctors do not wash their hands frequently enough, up to 50% of the time. Recalling the lesson taught by obstetrician Ignac Semmelweis, he points out the cause of childbed fever (puerperal fever) was the lack of washing hands. In 1847, 600 of 3,000 mothers delivering babies in Semmelweis's Viennese hospital, died from the bacteria Streptococcus, which leads to childbed fever. After instigating a wash up with chlorine and a nail brush for doctors and nurses, between patients, the death rate fell from 20% to 1%. Even though this procedure offered sufficient proof of success, doctors elsewhere declined to institute the hand washing. They simply could not believe that they themselves were making their patients sick. Recently, a surgeon named Jon Lloyd hit on an idea from the Save the Children program: Positive Defiance, or building upon capabilities people already have, rather than making them change their behaviors. After meeting with small groups (from kitchen worker and janitor to nurses, doctors, and even patients) in a trial Pittsburgh hospital, and instilling the staff's ideas, change was made. For example, they themselves decided where to best place new hand-gel dispensers. By empowering the employees, they worked together toward a common goal. The result at the end of one year, "the entire hospital saw its MRSA wound infection rates drop to zero." Dr. Gawande continues with news that The Robert Wood Johnson Foundation and the Jewish Healthcare Foundation are beginning to implement this initiative in ten more hospitals across the United States. To this point, no other idea has worked. Disappointing outing for this usually wonderful author.Granted he does not try to hide from the blemishes of the surgical world but the book at times went on and on and became boring. This book is far less engaging than his first, and espouses a mildly distasteful and shockingly simplistic message about doing better in the medical profession. Don't look for a enlightened analysis in Gawande's small-minded views here. In each chapter, Gawande examines the complexities of the topic and then tops it off with a conclusion that ignores all the subtleties of the issues at hand. Nowhere is this more evident than in his essay on the death penalty. There he, as always, weaves a truly engaging narrative about the doctors who aid in capital punishment. At the beginning he suggests that its a complicated issue with no clear moral conclusion. At the end, he asserts his own conclusion in a moral black and white. No matter that he has just finished a very convincing essay about how it is basically impossible to come to such a clear conclusion. The whole message comes off as arrogant and, inexplicably, uninformed. Constantly bombarded by the latest headlines in advances of genomics research, new drugs, and ever sophisticated machinery to help save human lives, Atul Gawande's book offers an insightful suggestion: diligence, transparency, and focus on data-driven improvement, on the part of the doctor, may well be the next frontiers if we're looking to transform the healthcare industry. Science helps, but ingenuity, and diligence of the doctor are often overlooked and underestimated. Having no affiliation to the healthcare industry, this book has definitely brought me to re-evaluate my relationship with my doctor, and gave me a much better understanding of what to look for in the future. This was my first book that dealt with medicine as the core subject and talked about perfomance. The average person rarely comes to associate both of these together and for some reason many of us treat doctor's as holier than thou. Dr Gawande raises some very pertinent questions specially in his essay's on the Battlefield and the Cystic Fibrosis - his notes on how the average lifespan of affected individual's(CF) has been rising over the years and how simple changes have made such big difference is very well depicted. His essay on how the surgeons in India were managing patients with such limited resources in such horrific conditions makes you think about the great divide between the resources of various nations - USD 4 in India compared to USD 7911 in US per person. Finally, its a very short book that should take not more than a few hours to finish, at the end of it, I started thinking will it be innovation, new drug research that will drive future medical advancements or small incrimental changes, ingenuity in the way we treat that will make a bigger impact. Atul Gawande's second collection of essays from The New Yorker continues in the same style as his debut, Complications. While the book covers such diverse topics as hand-washing practices among hospital caregivers, vaccination efforts in third world countries, physician-patient relationships and etiquette in various international settings, medical personnel participating in state executions, and malpractice law, the overarching theme of the collection is Gawande's view of clinical medicine as both a science and an art. Not discounting the central importance of scientific research and innovation, Gawande emphasizes that the most common of life-threatening mistakes occur not due to a lack of scientific understanding of a particular problem but rather a lack of diligence in adhering to practices and procedures that are elementary and thus easily forgotten. To the general public the words "modern medicine" are synonymous with expensive machinery and cutting-edge pharmaceutical therapies but the fact is that far more people in the US and around the world die because of iatrogenic drug-resistant pneumonias than high-grade gliomas (which is not a call-to-arms for gifted, savant doctors but a plea for diligence and discipline from every participant in the continuum of care). Of course the virulence of those infections has been increasing recently but that too can be linked to a lack of diligence in treatment -- excessive antibiotic prescription, inadequate antiseptic practices. Gawanda is a surgeon and a skilled writer. This collection of essays explores the ways in which changes in medical behavior and organization (as opposed to new scientific discoveries) can lead to drastic improvements in health and survival. He explores a broad array of applications, from interminable efforts to eliminate polio in India and elsewhere to impressive innovations in front-line war medicine in Iraq to ways that hospitals have tried to get doctors to ... wash their hands. Even though many of the essays were previously published (in the New Yorker), Gawanda has updated them and integrated them into the broader theme of the book. Some of the essays stray from that theme, such as the one discussing medical malpractice, but each one is engaging. Gawanda is excellent at writing for a lay audience: I have no medical training and found the book completely accessible. One of the principal messages, introduced early and revisited often, is that of "positive deviance": the idea that wonderful changes come from identifying (and learning from) individuals who deviate from norms and achieve impressive results. In his conclusion, Gawanda gives some ideas for becoming a positive deviant in medicine and in life. One is to "count something," building on the book's examples in which measurement systems led to drastic improvements in performance: one example is the Apgar score for newborns; another is the publication of cystic fibrosis treatment performance across hospitals around the country. Gawanda goes on to give a compelling example of how his own measurement helped him understand how to reduce sponges getting left inside patients. Surgeon Atul Gawande offers a reflective se of essays on today's practice of medicine. Anyone who is or who will become a patient - that basically includes everyone - should consider this thoughtful book. Gawande wields reverently the sanctioned power to open up peoples' bodies. One undercurrent in his book is the role that insurance reimbursement has on patient care (negative). Another undercurrent is the discipline of improvement as applied to medical practice. Practicing medicine is part science, part art. As in any endeavor, some practitioners are better than others and that which gets measured gets improved. Thus, Gawande suggests that measuring systems for quality, however imperfect, be nonetheless devised and applied. For an engaging peek behind the white lab coat, read BETTER by Atul Gawande! Gawande's essays contain honest observations of the conflicting roles that the medical profession play in the life and death of individuals and populations. He also asks seemingly obvious questions about why things are done in medicine and public health despite clear evidence that there are simple changes that can radically improve patients' health outcomes. There are no clear answers naturally, but the narratives provoke much thought. What is really striking is the humility in his advice about being a positive deviance through simple principles of diligence, doing right, and ingenuity. His suggestions to fellow doctors and medical students to ask an unexpected questions, not complaining, measure and write about one's experience, and adopting best practices continually are underpinned by the recognition of medicine more as art than science. That there is always uncertainty in how human beings respond to the best of care in the medical setting. That much is unknown, and even more is unknown about what the profession does not yet know. Perhaps a healthy dose of scepticisim, coupled with a dash of irreverence for sacred cows, and continually asking "Why not?" in medicine, may be what is needed to "do right". In Better, the anecdotes show just how unpredictable and irrational human behaviour can be despite the best of intentions. How surgeons who are obsessively sterile in the confines of an operating field ironically seem to blatantly disregard their own obsession once they are out of the OT. Stories about communities who reject the life-saving (and tragedy-preventing) public health measures to ring-fence polio outbreaks with vaccinations. What can medicine do to improve the quality of patient care around the world? That is, at its heart, the question that author Atul Gawande throws at readers and practitioners alike. "We can do better," he tells us, and thus begat the title: BETTER. Having thoroughly enjoyed Complications, I decided to check out Dr. Gawande's other writings and was pleasantly surprised to find this collection of stories. Although both Complications and Better are short story compilations, Complications lacked cohesiveness whereas Better had no such problems. Leading us down simple and often shocking paths, Gawande gives us complicated facts but in laymen's terms. The simplest would be his chapter on hand washing, and how effective it can be for preventing the spread of infection, especially such newly dangerous things as MRSA, an antibiotic resistant bacterial strain that is killing hospital patients far too often. The ease with which its spread is preventable is as simple as a hand cleanser, yet getting doctors (and other medical staff) to do this is nearly impossible. "We can do better." The beleaguered medical malpractice insurance requirements that plague every doctors pocketbook is hit hard upon, including a look at why it is necessary and why the system is headed for deep trouble. "We can do better." Probably the most telling chapters were directed at Dr. Gawande's return to India (his national homeland). Polio is on the run and is nearly extinct as a disease. Yet in small Indian provinces, occasional "hot spots" flare up and a band of less than 10 medical men and women must vaccinate over 4 million children in less than two weeks. And they do it. Gawande tells us if this is possible, can't the U.S. do better at fighting infection? The other striking aspect is how India's doctors often work with substandard supplies (or minimal) on dangerous cases. Or perform a surgery they've never done before or are ill equipped to handle. But handle it they do. One such case involved a boy with hydrocephalus ("water on the brain" caused by a build up of cerebral spinal fluid). No physicians at the hospital Gawande visited had ever done a shunt, the procedure necessary to relieve the pressure. But they eventually do a makeshift surgery that saves the boys life "using about as few supplies as I'd use for a suture repair." Quite an eye-opener. "We can do better." The chapters on CF (cystic fibrosis) are exceptionally well rendered as we learn that doing better at one thing can have huge benefits. When physicians focus all of their talents on cystic fibrosis, the result was astounding. Life expectancy for CF patients jumped from 17 years of age to over 40. And now it looks like they may very well be able to live into the 70s. It isn't some new super-drug that's extending these peoples lives, but looking at the disease process in terms of better treatment strategies; living proof that doing "Better" can help medicine achieve miraculous results. This book is well written and passionately effective in its detailing the modern realities of health care from all sides of the "aisle." The choices that we all make, doctors, insurers, patients, family members are reviewed in an anecdotal way that's clear, concise and well structured. The author writes very well, the anecdotes themselves are interesting and illuminating and the book is a good read. It appears to be a collection of essays that were published in The New Yorker? A good book to read and pass on to others. I have to agree with Stephen Laniel that Gawande's Better is such a thought-provoking and insightful book that I couldn't help but keep reading till the end (however, I am such a slow reader, so I wasn't able to finish it in 4 hours. Though I managed to finish reading it on my road trip back to New York City from Maine this weekend. Of course, I was sitting comfortably in the passenger seat. I do like "The Doctors of the Death Chambers" a lot. I think it was a tough call for the four physicians to make: whether to abide by the medical ethics codes or to "do it right" according to their conscience. Life is full of these ethical dilemmas that none of us can avoid. Normally we simply follow our gut feelings and if we are wrong likely it won't have any fatal or tragic consequence. But the dilemma these physicians encountered was particularly difficult as human lives were involved. They were being criticized by others as unethical and they could even jeopardize their jobs. Although medical professionals should be dedicated to preserve life, is it wrong to make it a less violent and more peaceful passing when the death is inevitable? Observing the rules blindly meant unnecessary and inhumane suffering during the execution, which is not something the medical society (or anyone of us) should encourage. "The bell curve" is my favorite. I was particularly impressed by Dr. Warwick's ingenuity. Not only does he constantly push the quality of care he delivers to a higher level and strive for perfection, he also pushes his patient to do better and try harder. During the course of treatment, patients do play a key role in getting the desirable outcome. I couldn't help but keep thinking about a disappointing dialogue I had with my primary care physician when I told her I had been experiencing knee pain lately - mostly after running for over 40 minutes (funny it's as if my knee has a timer). She simply gave me a cold response, "You just have to stop running." I thought to myself that running is what gives me "bliss," so how can I just give up without even "trying" to fix the problem? If I were lucky enough to have Dr. Warwick as my physician, he would have asked the questions to lead to a more proper diagnosis and offered a workable treatment plan that allows me to run a half-marathon, if not a full marathon. Even if I wouldn't get better, at least we wouldn't give up. Definitely don't miss the Afterword. The suggestions for becoming a positive deviant are not limited to physicians only. They can be applied more broadly to every single individual. Everyone is given the opportunity to be a positive deviant in whatever aspect of life we desire (be it our professional endeavor, our interpersonal relationship, or our social responsibility, etc...). If you do miss the Afterword, here is the essence: As Atul suggested, "Find something new to try, something to change. Count how often you succeed and how often you fail. Write about it. Ask people what they think. See if you can keep the conversation going. I enjoyed this book so much that I finished his other book titled "Complications" upon returning to NYC and continue to read through the articles posted on Dr. Gawande's website at http://www.gawande.com. Coincidentally I recently came across an article titled "Where in the body is that sponge?" in the July 2008 issue of Health IT News (Yes, I am a geek in Health IT) which is related to Dr. Gawande's recent published findings in the Annals of Surgery about a computer-assisted method of counting surgical sponges (see http://www.gawande.com/documents/2008AnnSurg--BeyondCountingeditorial.pdf). 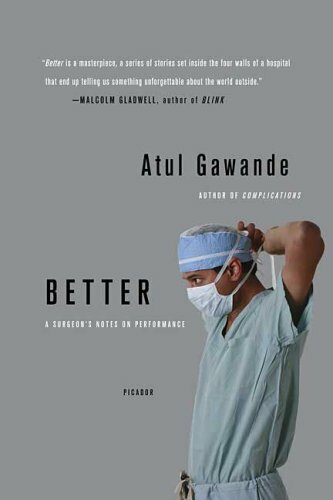 Atul Gwande's "Better: A Surgeon's Notes on Performance" is a collection of essays that probe skillfully and poignantly into the depths of medical ethics and the performance of doctors. He is a fine researcher and an astute observer who carefully delineates many facets of each issue that he explores, be it washing hands, malpractice concerns, or the Apgar score. As a non-fiction writer, I was acutely aware of how adept Gawande is at using narrative to illustrate and discuss complex moral and ethical issues. He does not skirt controversial notions such as what happens to the soldiers who have been saved from grave injury on the battlefield and come home limbless and with horribly scared faces? Or why hospitals avoid publicizing the results of their effectiveness in treating certain conditions? At the end of his book, he makes five suggestions about how doctors might make a worthy difference. All of these suggestions make sense for anyone wanting to make a difference. I'm only going to mention one that hits close to home: He says, "write something. . . it makes no difference if you write five paragraphs for a blog, a paper for a professional journal, or a poem for a reading group. Just write." A fascinating book, with great stories on a timely subject. I especially liked the chapters on Diligence. I tend to agree with Gawande that if the U.S. health system concentrated less on new drugs and fancy treatments, and more on good patient management and careful followup, we'd all be better off. Atul Gawande's second book is the first work I've read that falls under that bookstore subcategory of "Medical Literature." It's one of those books that can stimulate an interest for a subject in an initially less-than-curious reader. Firstly, Dr. Gawande's prose is very straightforward and approachable; his descriptions are nontechnical without sacrificing detail. Many chapters address issues to which the average person often has knee-jerk reactions to, such as medical malpractice. There are also quite enlightening passages: I for one have always been curious about how the current system for compensation for medical services came about. Perhaps the strongest feature of Dr. Gawande's writing is the presentation of multiple perspectives, complete with interviews, example cases, and history. The author does not try to hammer his views across, but presents issues that the average reader might not have ever thought too deeply about. By providing a complete framework of an issue, the reader is then able to consider the subject from multiple angles. I'm always on the side of self-education when it comes to medical topics, especially in light of the current health care system and its looming problems. Gawande's skill is in writing movingly ab out all sorts of medical issues, including both failures and successes, in a way that illuminates the complexities of practicing medicine in today's world of HMOs, soaring premiums and more. Atul Gawande asks the hard questions. How can a doctor who is just a human be expected to be a god? Gawande looks at the profession from the mundane (hand washing) to the ethical mountain tops (physicians attending executions). The odd thing is that the death row docs have not killed nearly as many people, in the big picture, as the ones who forget to sufficiently scrub up. Dr. Gawande tells us about the challenges and changes in obstetrics, cystic fibrosis, and the use of chaperones in examining rooms, trauma practice and many other little niches in the health care system from an insider's point of view. This book is a compilation of essays some of which have been published elsewhere as was the case with his first work, COMPLICATIONS. There the comparison ends. Dr Gawande's writing and attitude have grown and matured. Here we see the professor who provokes us to thought as well as teaches. The book opens with an introduction which was a story of how a senior resident senses that a patient may be sicker than her vital signs reveal. Following his clinical judgment he is more judicious than most would be. By his judiciousness he saves a patient's life. This essay sets the stage for book. The book is divided into 3 sections Diligence, Doing Right and Ingenuity, the qualities he feels doctors need to embody. Then he uses the power of story to illustrate those qualities. He raises procative questions. He shares with us fascinating stories some that are inspiring and others that are disappointing, others controversial. All give us pause for thought . This is a book that all of us should read especially now a health care reform must occur and we are facing the question How can we do better? Closing the gap between intentions and outcomes. Under the heading of `Diligence', Dr Gawande writes about the importance of handwashing, attempting to eradicate poliomyelitis, and the treatment of casualties of war. Under `Doing Right', Dr Gawande addresses the use of chaperones during medical examinations, medical malpractice, income earned by doctors, the roles of doctors in capital punishment, and issues around aggressive medical treatment. Under `Ingenuity', Dr Gawande covers medical intervention in the process of birth, excellence in treatment for cystic fibrosis, and medical care in India. Finally, Dr Gawande offers suggestions to medical students (and others) about making a difference by becoming `positive deviants'. In summary, the answer to the question posed by Dr Gawande could well be the following `Do what is right and do it now' (Dr Virginia Apgar, as quoted on Page 186). This is well written book which, while it draws on examples in the field of medicine, contains lessons for each of us who strive to make a difference. Technology provides many solutions and enables advances in areas previously thought impossible. But it is human ingenuity that underpins technological advance, and sometimes it is simple human practices that have the biggest impact. I recommend this book to those who are interested in striving for excellence more generally. Wow - from start to finish!